If you need a hospital disinfectant to sanitize surfaces and floors in your healthcare facility, we have the cleansers you need! Not only will these disinfectants create a more sanitary environment, but they'll also freshen it up by removing odors in kitchens, bathrooms, and more! Use aerosol deodorant to add even more refreshing fragrance to your business. For other cleaning essentials, be sure to check out our restroom cleaning chemicals, surface disinfecting chemicals, and hard floor cleaning chemicals. 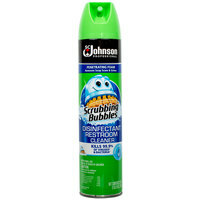 If you're wondering where to buy scrubbing bubbles disinfectants, we have a large selection of scrubbing bubbles disinfectants for sale at the lowest prices.